The Opto-electronic oscillator circuit is comparable to the optoelectronic feedback circuits which are established by the Neyer and Voges in the 1982 year. In 1984 by Nakazawa and later on in the year 1992 by Lewis. The Opto-electronic oscillator is based on the converting continuous light energy from the pump laser to radio frequency, microwave or mm-wave signal. The OEO characterized by high-quality Q factor and stability and the other functional characteristics is not gladly achieved with the electronic oscillator. The result is in unique behavior with the use of electro-optical and photonic components and they are generally characterized by high frequency, low dispersion and high speed in the microwave frequency. What is an Opto-Electronic Oscillator? The Optoelectronic oscillator is an Opto-electronic circuit. The output of the circuit is in the form of the sine wave or modulated continuous wave signal. It is a device where the phase noise of the oscillator does not increase the frequency and it is subject to the implementation of the electronic oscillators like crystal oscillator, dielectric resonator, and sir dielectric resonator. 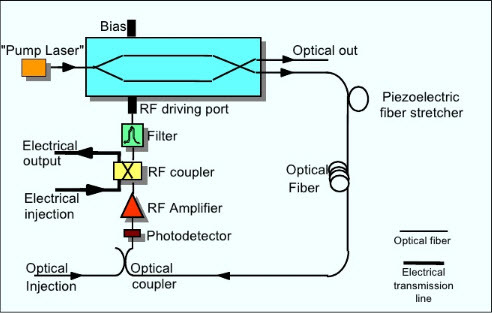 The following figure shows the operation of the Opto-electronic oscillator and by observing the circuit the Optoelectronic oscillator starts with continuous wave laser is penetrating into the intensity modulator. 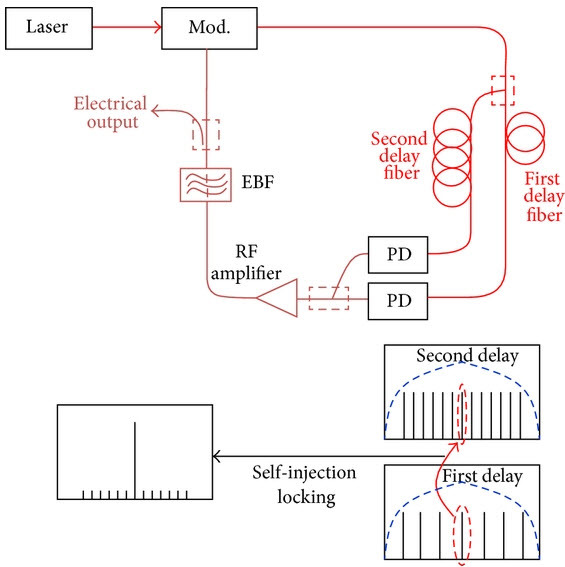 The output of optical intensity modulator is passed through a long optical fiber delay line and into a photodiode. The improved electrical signal is applied and approved through an electronic bandpass filter. To complete the Opto electronic cavity the output of the filter is connected to the RF input of intensity modulator. If the gain of the cavity is greater than the loss, then the optoelectronic oscillator is will start the oscillation. 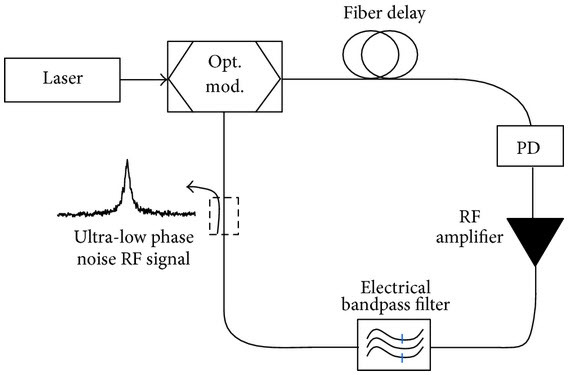 The electronic band pass filter selects the frequency of the diminished the other free running modes of the cavity which is below the threshold. The OEO is different from the before Optoelectronic circuit by using the very low loss of the optical fiber delay line to produce a cavity with a huge high Q factor. The Q factor is the ratio of the stored energy in the cavity over the loss of cavity. Thus the loss of the fiber delay line is in the order of the 0.2dB/ km with a less little loss a very long fiber is stored in a large amount of energy. Because of the Q factor, the OEO can achieve the level easily of 108 and it can translate to 10GHz clock signal with a phase noise of 140 dBc/Hz at 10kHz offset. The following graph shows required timing jitter for an analog to digital converter at a sampling rate. 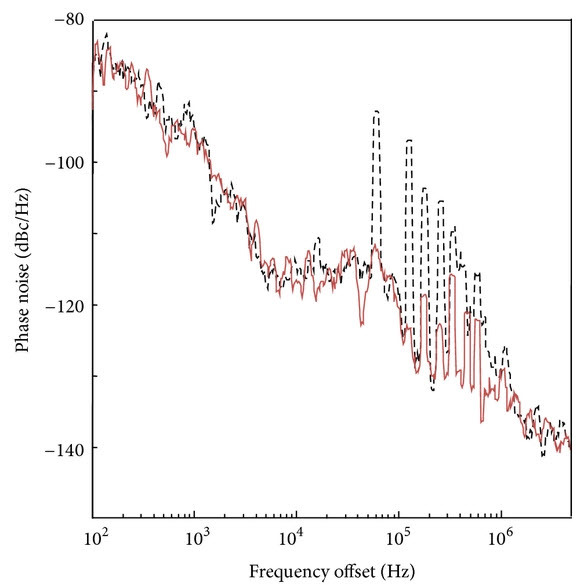 In the graph, we can see the improvement in the timing jitter, derived from the phase noise of an OEO has inverse square root dependence on the fiber length. The figure shows the dual loop Optoelectronic oscillator with the cavity mode within the band pass filter. To achieve the high Q factor for the Optoelectronic oscillator there should be the maximum fiber length. If the fiber length increases the space between the cavity modes will be decreased. 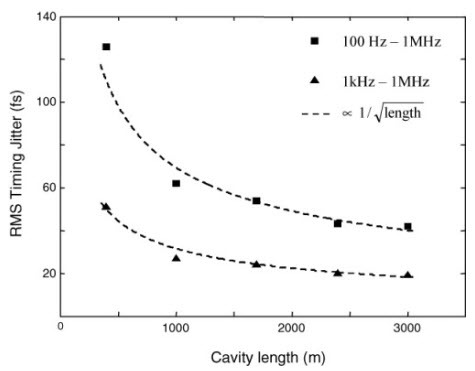 For an example, a 3 km length of the fiber will yield a cavity mode spacing of 67 kHz approximately. The high-quality electrical band pass filter is at 10GHz has 3dB bandwidth of 10MHz. Hence there will be many nonoscillating modes to continue through the electrical band pass filter and it can present in the phase noise measurement. There is another method to reduce this problem by second fiber length into the Opto-electrical oscillator. The figure shows the example of this type of OEO. There will be the own set of cavity modes for the second loop of the OEO. If the length of the second loop is not a harmonic multiple of the first loop, hence the cavity modes will not overlap with each other and this we can see in the figure. On the other hand the modes from each loop which are closest each other will lock and hold back the band pass the other cavity modes. The following figure shows the single loop phase noise spectrum with the side modes next to the dual loop spectrum with the side mode suppressed below. The exchange of the system is the phase noise and it is an average of the noise of the two loops independently, there is no phase noise just a long loop. Hence, both the loops support the side modes and they are completely not eliminated, but they are suppressed. In this article, we have discussed the Opto-Electronic Oscillator Circuit Operation and Applications. I hope by reading this article you have gained some basic knowledge about the Optoelectronic oscillator circuit. If you have any queries about this article or to know about the different types of oscillator circuits with its applications please feel free to comment in the below section. Here is the question for you, what are the functions of the Optoelectronic oscillator?